The future direction of First 5 Orange County is influenced by many current realities and long-term trends. We are also influenced by ongoing research, best practices, and innovation within the field of early childhood, as well as by feedback from our community partners and stakeholders. 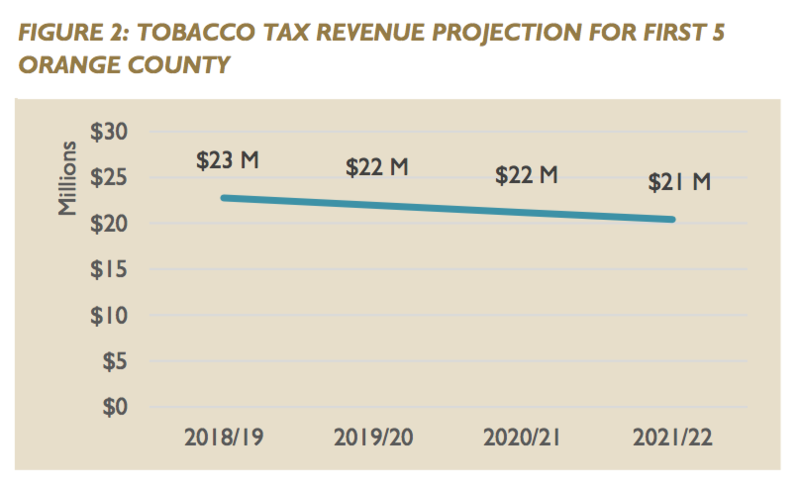 Declining revenue: Tobacco tax revenues are declining statewide, which translates to declining revenue for all First 5s in California, including First 5 Orange County. This is placing pressure on First 5s statewide to consider a range of responses, including leveraging investments, targeting services, seeking policy changes to sustain critical services, transitioning F5 programs to other agencies, or discontinuing programs. 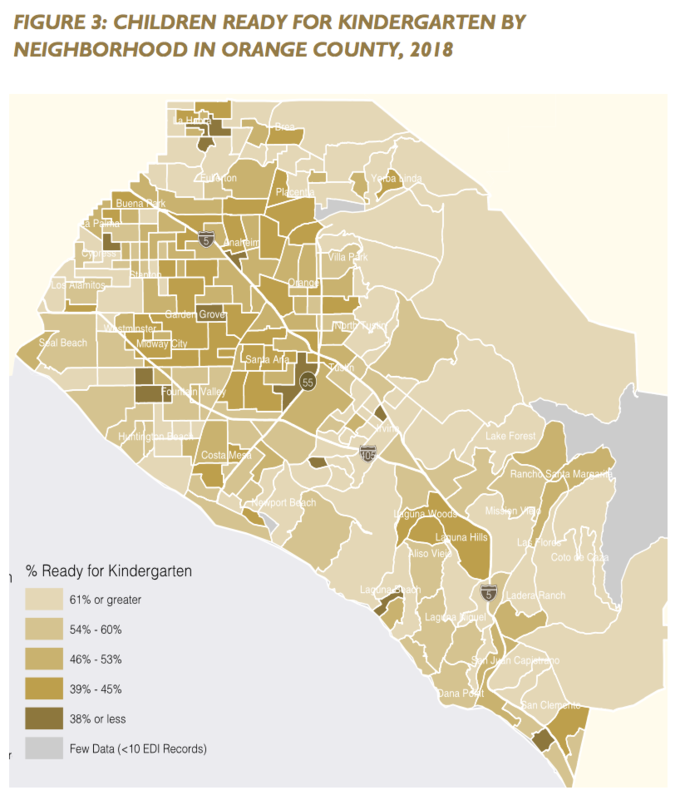 Persistent disparities: Overall, kindergarten readiness is improving steadily; however, the data by neighborhood make it clear that all children do not have the same access to supports within their family or in their community. Consequently, not all Orange County children are entering school ready to achieve their full potential. System coordination needs: A growing body of research and practice shows that an early childhood system will produce optimal results when universally needed services (e.g., developmental screening and well child checks) and identified services (e.g., early intervention and/or medical treatment) are both available and coordinated. Like many regional early childhood systems, Orange County’s system has opportunities to improve coordination. Evolving roles: Our community sees our engagement in multiple sectors of the county’s early childhood system as a natural platform to promote the wellbeing of young children and their families across the system. This has not been an area that First 5 Orange County has fully developed in the past. Fewer young children: Demographic projections point to fewer children ages 0-5, largely as a function of a declining birth rate. In 2019, there were an estimated 225,840 children ages 0-5; by 2045, there will be an estimated 193,560. Continuing diversity: Over the past 20 years, Orange County has witnessed increasing diversity among young children; however, projections to 2045 anticipate similar racial and ethnic distributions as today, with 43 percent of young children identifying as Hispanic, 33 percent White, 16 percent Asian, six percent multi-racial, and two percent African American. Insufficient supply of early care: The supply of subsidized care for children 0-2 years falls significantly short, with 36,044 infants and toddlers unserved relative to those eligible. In addition, 19,580 preschool children remain unserved compared to the need for subsidized care. Family poverty: Among families with at least one child under age six, 18 percent are living in poverty, rising to 47 percent in families led by a single parent. Family homelessness: On average, each month between 40 or 50 families enter the Coordinated Entry System, a database that homeless service providers use to help homeless individuals and families find housing. The strategic plan concretely identifies how First 5 Orange County will position itself to effectively respond to these trends and current realities. While we have identified some challenges, rather than focusing on what is being lost, we are embracing an intentional asset orientation, which enables us to consider how we can best invest our human and financial resources to have the greatest impact. First 5 Orange County is committed to continue to fund mission-driven direct services that help all Orange County children reach their full potential. However, to achieve greater impact in an era of declining revenue, First 5 Orange County recognizes that some children and families need more support than others to be successful. We also recognize that we must increasingly see ourselves as a catalyst, capacity builder, and strategic investor, deemphasizing direct service provision and more strongly embracing system-level impact. Strategic: We will maximize our impact by investing strategically in programs and services that build and support a thriving early childhood system. Collaborative: We will develop and leverage community partnerships to drive change. Efficient: We will increasingly invest in strategies and partnerships that help the early childhood system work more effectively and efficiently. Focused: We will continue to improve outcomes for all children while focusing on children that need additional support to reach their full potential. Catalytic: We will support efforts to leverage other public resources and build capacity to sustain or expand the reach of critical programs and services. Leaders: We will embrace and enhance our role as a convener, resource, and leader in early childhood. These foundational positions undergird all of the strategic plan goals and objectives, strategic directions, and implementation activities.